Nickname(s): "Yellowhammer State", "Heart of Dixie", "Cotton State"
Map of the United States with Alabama highlighted. The State of Alabama declared that it had seceded from the United States of America on January 11, 1861. It then quickly joined the Confederate States during the American Civil War. A slave state, Alabama provided a significant source of troops and leaders, military material, supplies, food, horses and mules; however, very little of the state's cotton crop could be sold, as the main port of Mobile was closed off by the U.S. Navy. After the election of Abraham Lincoln from the anti-slavery Republican Party in 1860, the State of Alabama decided to declare secession from the United States, in order to oppose the equality and citizenship of African Americans, and in order to prolong and perpetuate the practice of slavery in the state. – Article IV, Section 1, Constitution of the State of Alabama, (1861). Antebellum Governor Andrew B. Moore energetically supported the Confederate war effort. Even before hostilities began in April 1861, he seized U.S. facilities, sent agents to buy rifles in the Northeast, and scoured the state for weapons. 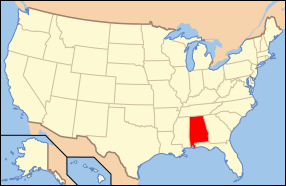 Despite some resistance in the northern part of the state, Alabama joined the Confederate States of America. Congressman Williamson R. W. Cobb, a Unionist, pleaded for compromise. He ran for the First Confederate Congress, but was soundly defeated (he was subsequently elected in 1863 on a wave of anti-war sentiment, with war-weariness growing in Alabama). The new nation brushed Cobb aside and set up its temporary capital in Montgomery and selected Jefferson Davis as president. In May the Confederate government abandoned Montgomery before the sickly season began and relocated in Richmond once Virginia had declared that it had seceded. Alabama was not the scene of any significant military operations, yet the state contributed about 120,000 men to the Confederate service, practically all the white population capable of bearing arms. Most were recruited locally and served with men they knew, which built esprit and strengthened ties to home. Medical conditions were severe; about 15% died of disease, and 10% from battle. Alabama had few well-equipped hospitals, but it had many women who volunteered to nurse the sick and wounded. Soldiers were poorly equipped, especially after 1863, and often resorted to pillaging the dead for boots, belts, canteens, blankets, hats, shirts and pants. Alabama soldiers fought in hundreds of battles. The state's losses at Gettysburg were 1,750 dead plus even more captured or wounded—the famed "Alabama Brigade" took 781 casualties. In 1863 Federal forces secured a foothold in northern Alabama in spite of spirited opposition from Confederate cavalry under General Nathan B. Forrest. From 1861 the Union blockade shut Mobile Bay, and in 1864 the outer defenses of Mobile were taken by a Federal fleet during the Battle of Mobile Bay. On April 12, 1865, three days after the surrender of Robert E. Lee at Appomattox Courthouse, the city of Mobile surrendered to the Union army to avoid destruction following the Union victories at the Battle of Spanish Fort and the Battle of Fort Blakely. The Magee Farm, north of Mobile, was the site of preliminary arrangements for the surrender of the last Confederate States Army east of the Mississippi River. Confederate General Richard Taylor negotiated a ceasefire with Union General Edward Canby at the house on April 29, 1865. Taylor's forces, comprising 47,000 Confederate troops serving in Alabama, Mississippi and Louisiana, were the last remaining Confederate force east of the Mississippi River. After the Tennessee and Cumberland rivers were taken, Union forces temporarily occupied Northern Alabama until the fall of Nashville allowed permanent occupation of counties north and west of the Tennessee River, while the Union blockade applied pressure in the southern part of the state. There was a small loyalist element in northern Alabama; it needed Union military support to survive. On the one hand, with Union troops present, Southern Unionists were finally able to come out of hiding, join the Union Army if desired, and care for their families, who were now protected from Confederate partisans. On the other hand, Union troops doubled the amount of regional foraging compared to the Confederates. Federal foragers in Northern Alabama were, for the most part, an adventurous group that were aided by loyal Unionists, and they took all they needed for their vast forces, often raiding farms and homes previously struck by the Confederates. Before the arrival of Federal troops, local Unionist resistance networks were based on underground cells that aided pro-Union Loyalists by means of finances, contacts, supplies, and much needed local intelligence. Union partisans were motivated by a sense of duty and obligation to the Union cause and a need to protect their family and Unionist friends. They were also motivated by a desire for vengeance for all the wrongs they had suffered at Confederate hands throughout the war. The women of the Alabama Unionists helped with long distance communication networks, and they were able to move freely from town to town because of their gender. When these women lost their husbands, it was often a struggle to survive, and they were completely ostracized by the pro-Confederate women. According to historian Margaret M. Storey, "Regardless of the Union's ambivalence toward slaves and slavery, black men and women in Alabama" saw the Union occupation as the surest path to freedom. With regard to Union foraging and the practicing of hard war, while some slaves and free blacks "viewed the loss of goods as negligible in light of the security and opportunities", for others "federal occupation brought them loss of even small property [and] meant increased vulnerability to whatever white people won the war." Many of the Confederate guerrillas in northern Alabama were detached cavalry units that were used to great advantage in protecting the home front, as opposed to serving in the main army. The primary mission of the pro-Confederate guerrillas was to attempt to keep intact the Confederate social and political order. They assisted the war effort in their own backyards by hunting down and arresting Unionists, conscripts, and deserters. In addition, they terrorized Unionists by destroying their property and threatening their families. Confederate guerillas were made up of four types of fighters–the first half of these were under Confederate supervision, being either detached cavalry or enlisted men fighting close to home. The other units either fought disguised as noncombatants or were simply outlaws looking for blood-letting opportunities. These men were not under Confederate control and were as interested in profit as helping the Southern cause. Not all Union partisans were confined to the Union-occupied areas of Alabama. In the southeast Alabama counties of Dale, Coffee and Henry (which included present-day Houston County and Geneva County, as well), for instance, guerrillas led by local Unionist John Ward operated virtually at will during the last two years of the war, finding refuge in the vast pine forests that covered this region. These renegades sometimes worked with regular U.S. forces based in Pensacola, Florida, and their depredations led several leading citizens of these counties to petition the governor, T.H. Watts, for military assistance against them. Local citizens, such as Methodist minister Bill Sketoe of Newton, were even hanged by Home Guard elements for alleged acts of collaboration with these guerrillas. Alabama soldiers fought in hundreds of battles; the state's losses at Gettysburg were 1,750 dead plus even more captured or wounded; the famed "Alabama Brigade" took 781 casualties. Governor Lewis E. Parsons in July 1861 made a preliminary estimate of losses. Nearly all the white men served, some 122,000 he said, of whom 35,000 died in the war and another 30,000 were seriously disabled. The next year Governor Robert M. Patton estimated that 20,000 veterans had returned home permanently disabled, and there were 20,000 widows and 60,000 orphans. With cotton prices low, the value of farms shrank, from $176 million in 1860 to only $64 million in 1870. The livestock supply shrank too, as the number of horses fell from 127,000 to 80,000, and mules 111,000 to 76.000. The overall population remained the same—the growth that might have been expected neutralized by death and emigration. Alabama in the American Civil War Facts for Kids. Kiddle Encyclopedia.